The image on this article showing the download, upload and ping results of my 1Mbps DSL broadband subscription was taken using SpeedTest.Net while I was singly connected to the Internet and writing this blog. 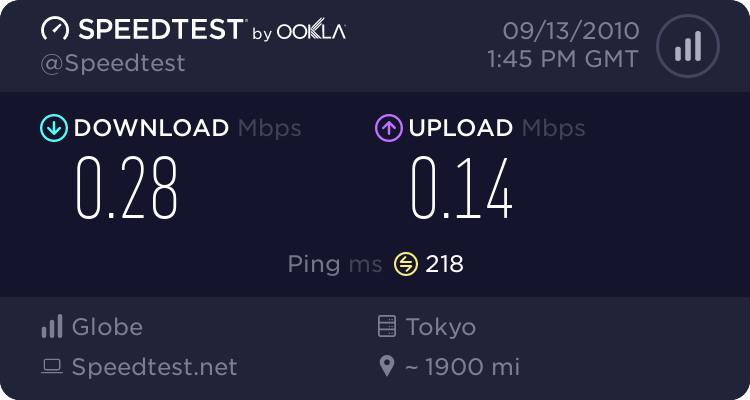 I used the Tokyo server for the test because that is where the parents of my 3-year old grandchild (apo) reside and make weekend video calls to our house using Yahoo Messenger (YM). The results show only twenty-eight (28%) of the bandwidth promised by my ISP and clearly indicate the sorry state of the Internet in the Philippines. And yes, the calls between my apo and her Mommy are always choppy with frame-by-frame video at Tokyo side. By the way, my son pays 2,600 yen (PhP1,300) per month for their 100Mbps connection while my 1Mbps monthly subscription costs PhP995. We all know that Internet connectivity is the lifeblood of the i-café business. The success of an i-café is entirely dependent on the quality of connection it gets from its Internet service provider. No connection to the Internet means no income for the business so I can only sympathize with i-café owners who always get the losing end on their deals with service providers. Currently, i-café owners who get good Internet connections are much lesser in number than those getting lousy ones. The sorry state of the Internet in a country is an indication of its bad economic situation. Recent studies had established that Internet connectivity has influence on a nation’s economic growth. A ten (10%) increase in connectivity of a country results to 1.38% growth of its economy. Does our government know this and aim for quality improvement and increased connections to the Internet? I hope they do. My burst speed (on speedtest.net, that’s the one that usually appears at the end of the test) reaches at around 1Mbps (I am subscribed at 782kbps – PLDT DSL Bundle). however, the usual rate is at 700 – 800 kbps.. not bad actually for my side. Congested line gives me around 500.. but never went below 400. The only issue I had with them is poor billing department and no dial tone/no internet issues that happened twice in two months. I’ve been with 3 providers (smartbro, globe fixed wireless, and PLDT), and PLDT has been the best provider for me so far (my complaint to smartbro reached NTC, I have a pending complaint against Globe). I agree to your post, I don’t care what other users say but I used to own an internet cafe. One thing that I really was disappointed was internet speed. I went through several and different servers and upgrade packages and even go to point which I feel awkward doing is asking someone I know that worked for PLDTand tweaked my settings. But then again, the servers are not reliable, I got 20-30 % down time which really hurt my business. I see internet cafes in Phil. is gonna go downhill in future as it is getting cheaper to buy laptops and lots of free wi-f- available. So all that said, I finaly decided to close my net cafe and forget about the headache caused by slow internet connection. This is a really interest post. I didn’t know that internet productivity corresponded to a country’s growth. I would love to read the source that came from. Thanks!